Critical loads and levels are a tool for assessing the risk of air pollution impacts to ecosystems. APIS provides critical loads and levels for different pollutants. The user can also undertake site specific searches to obtain data on pollution exposure at a specified location and the appropriate critical load/level for the specified habitat/location. 3. Summary of Critical loads and level values and their derivation. 3.1 Critical Loads for Nutrient Nitrogen. 3.2 Critical Loads for Acidity. 3.5 What kind of biological effects can be expected when there is an exceedance?. 4. Using critical levels and loads. 4.1 Using critical loads/levels for national/international policy development. 4.2 Using critical loads/levels for impact assessments. 4.3 General enquiries about habitat/species responses to air pollutants and their critical loads/levels. 5. Searching for critical loads/levels and deposition/concentrations at specific locations. 6.1 Critical Loads and Levels. 6.2 Deposition and Concentration data. Here we provide an introduction to critical loads and levels, their derivation and status, and a 'sign-posting' to critical loads/levels information on APIS. It is important to distinguish between a critical load and a critical level. The critical load relates to the quantity of pollutant deposited from air to the ground, whereas the critical level is the gaseous concentration of a pollutant in the air. Empirical critical loads for nutrient nitrogen are set under the Convention on Long-Range Transboundary Air Pollution. They are based on empirical evidence, mainly observations from experiments and gradient studies. Critical loads are assigned to habitat classes of the European Nature Information System (EUNIS) to enable consistency of habitat terminology and understanding across Europe. Critical loads are given as ranges (e.g. 10-20 kgN/ha/yr). These ranges reflect variation in ecosystem response across Europe. An indication of the confidence in the critical loads is given by an uncertainty rating (reliable, quite reliable and expert judgement). APIS has provided a table of critical loads to use in impact assessments (e.g. assessments that are part of planning applications or environmental permit applications). Nutrient nitrogen critical loads were most recently revised in June 2010 at a workshop in Noordwijkerhout. The new values are used in APIS. A table of the new/revised critical loads is provided here, this also provides a comparison with 2003 critical loads values. Two methods are used for calculating acidity critical loads for terrestrial habitats in the UK: an empirical approach is applied to non-woodland habitats and the simple mass balance (SMB) equation is applied to both managed and unmanaged woodland habitats. For freshwater ecosystems, national critical load maps are currently based on the First-order Acidity Balance (FAB) model. All of these methods provide critical loads for systems at steady-state. For further information see http://cldm.defra.gov.uk. Mineral weathering in soils provides the main long-term sink for deposited acidity. Using this principle, critical loads of acidity can be based on the amount of acid deposition which could be buffered by the annual production of base cations from mineral weathering. In the UK, empirical critical loads of acidity for soils have been assigned to each 1km grid square of the country based upon the mineralogy and chemistry of the dominant soil series present in the grid square. The soil series are assigned to one of five critical load classes. This classification, based on weathering rates and mineralogy, is inappropriate for peat soils, which contain little mineral material. Instead, for peat soils, acidity critical loads are based on the concept of effective rain pH i.e. total acidifying pollutant load divided by runoff. This method sets the critical load to the amount of acid deposition that would give rise to an effective rain pH of 4.4, which reflects the buffering effects of organic acids upon peat drainage water pH. The SMB equation is the most commonly used model in Europe for the calculation of acidity critical loads for woodland ecosystems. This model is based on balancing the acidic inputs and outputs from a system, to derive a critical load which ensures that a critical chemical limit (related to effects on the ecosystem) is not exceeded. The acidity critical loads for UK freshwaters are calculated using the First-order Acidity Balance (FAB) model. FAB is a catchment-based model used to derive linked critical loads of sulphur and nitrogen. Freshwater critical loads are based on data from a national survey of lakes or headwater streams, where a single site, judged to be the most sensitive (in terms of acidification) was sampled in each 10km grid square of the country. In less sensitive regions (eg, south-east England) the sampling generally consisted of one site in each 20km grid square. In 2004 this "mapping dataset" was updated to include sites from other surveys and networks, where appropriate data were available. To date the models have been applied to 1595 sites in Great Britain and 127 in Northern Ireland. Hence the freshwater critical load maps do not represent all waters in the UK and the results are mapped by site location. This means that in APIS it is not possible to provide critical loads for freshwaters in the search by location tool or the site relevant critical loads (see section 4). Deposition of sulphur, as sulphate (SO4 2-), and nitrogen, as nitrate (NO3-), ammonium (NH4+) and nitric acid (HNO3-), can cause acidification and both sulphur and nitrogen compounds must be taken into account when assessing acidification of soils. For the purposes of determining links between critical loads and atmospheric emissions of sulphur and nitrogen, critical loads are further derived to produce a maximum critical load for sulphur (CLmax), a minimum critical load for nitrogen (CLminN) and a maximum critical load for nitrogen (CLmaxN). These components define the critical load function and when compared with deposition data for sulphur and nitrogen, they can be used to assess critical load exceedances. Calculating exceedance of an acidity critical load function, or the significance of a contribution from a source, is complex. Therefore, APIS provides a tool which calculates the exceedance for you. It enables you to compare acid deposition to the critical load function to help make a decision on the significance of a process contribution. Critical Levels for air pollutants in APIS are shown in Table 2. These values are not habitat specific, as in critical loads, but have been set to cover broad vegetation types (e.g. forest arable, semi-natural), often with critical values set for sensitive lichens and bryophytes. Critical levels for the different pollutants shown in Table 2 have been derived from experiments and observation that show varied effects on vegetation including visible injury symptoms of exposure (e.g. leaf discolouration and leaf loss), and species composition changes in semi-natural vegetation. Table1 - Critical levels of air pollutants. There are two methods for setting critical levels of ozone on plant communities i) the cumulative stomatal flux or ii) the cumulative exposure over a threshold value known as AOT40 (and a threshold value of 40 ppb O3). Scientific evidence suggests that observed effects of O3 on vegetation are more strongly related to the uptake of O3 through the stomatal leaf pores (stomatal flux) than to the concentration in the atmosphere around the plants (Defra, 2017; Mills et al., 2011b). The metric used to define the stomatal flux is known as the Phytotoxic O3Dose above a threshold flux of Y (PODY).This is based on the accumulated stomatal O3 uptake during a specified time or growth period taking into account the varying influences of temperature, water vapour pressure deficit (VPD). AOT40 accounts for the atmospheric O3 concentration above the leaf surface and is therefore biologically less relevant for O3 impact assessment than PODY. Different metrics have been developed for PODY depending on the complexity of the model and its application. These include a) PODYSPEC which is a species or group of species-specific PODY that requires comprehensive input data and is suitable for detailed risk assessment and b) PODYIAM which is a vegetation-type specific requiring less input data and is suitable for large-scale modelling, including integrated assessment modelling. The biologically most relevant risk assessment will be achieved by calculating PODYSPEC using biogeographical region-specific O3 flux models and critical levels for individual plant species or groups. Assessment of the critical level for O3 is divided into three broad vegetation types – crops, forest and semi-natural vegetation. For each vegetation type certain metrics are used to assess the exceedance of critical levels and risk – namely crop yield, tree biomass and biomass and seed/flower production for semi-natural vegetation. Quantification the extent of risk and calculating percentage effect due to O3. The ICP Vegetation report 2017 on the Mapping of critical levels of vegetation provides an in-depth description of the methodology and approaches that has been researched for setting critical levels for ozone (full link and reference at the bottom of this page). There are no critical loads for heavy metals at present in APIS, but researchers have started to develop effects-based critical levels and critical loads for some heavy metals in soils and freshwaters. A number of studies have been carried out to assess critical loads of heavy metals, in particular for cadmium (Cd), lead (Pb) and mercury (Hg). The critical load for heavy metals in forests (g ha-1 yr-1) is defined as the removal of heavy metals by biomass harvesting or net uptake in forest ecosystems from the mineral topsoil plus the critical leaching of heavy metals from the mineral topsoil. Exceedance maps for Europe have shown that critical loads of Cd are exceeded in very limited areas. Critical loads for lead are exceeded in large parts of western, central and southern Europe, as well as in southern Russia. The area with critical load exceedances for Hg strongly resembles that for Pb. Critical loads for protection of ecosystems have recently been calculated for a number of heavy metals (cadmium, lead, copper, nickel and zinc) for six UK habitats (ROTAP, 2012). However, for many metals there is a large discrepancy between emission estimates and measured deposition. There is also too little quantitative data to accurately identify the sources of the metals currently recorded in UK air. Until these issues can be resolved by further work, it is not practical for APIS to provide site relevant heavy metal critical loads. However, this does not preclude consideration of heavy metals critical loads in the assessment of relevant1 new developments on a case by case basis provided deposition at the site can be validated using information sources on heavy metals that already exist. This information might include, for example: existing soil guideline values in H1 in England and equivalent horizontal guidance in Scotland and Northern Ireland and existing information on the designated site. Further development of heavy metal critical loads may allow their future inclusion in APIS (e.g. through the APIS site relevant critical load tool). 3.5 What kind of biological effects can be expected when there is an exceedance? Table 2: Exceedance impacts for terrestrial and freshwater ecosystems. Decrease or loss of sensitive lichens and bryophytes. There is a potential in N-limited systems for N deposition to change algal productivity and nutrient regimes in upland lakes. Terrestrial - Leaching will cause a decrease in soil base saturation, increasing the availability of Al3+ ions, mobilisation of Al3+ may cause toxicity to plants and mycorrhiza, and have a direct effect on lower plants (bryophytes and lichens). Freshwater - Increase Al3+ concentration associated with freshwater acidification, impact on invertebrate populations, toxicity to fish. Direct damage to sensitive species, for example, leaf discoloration, bleaching, observed in Sphagnum species at high concentrations. Increase in algal growth over Sphagnum. Suppression of root uptake of cations such as Ca, Mg and K leading to nutrient imbalances (DoE 1993). Changes in species composition of groundflora, bryophyte and lichen communities. Visible symptoms, for example, leaf discoloration. Stimulated growth at low concentrations of S potentially changing community composition. The vulnerability to direct damage of mosses, liverworts and lichens which are often sensitive to lower concentrations than those causing injury to higher plants. Visible symptoms for example, leaf discoloration. The vulnerability to direct damage of mosses, liverworts and lichens which receive their nutrients largely from the atmosphere. The critical loads and levels approach has primarily been used to map on a national scale the extent of deposition and concentrations which exceeds critical loads and levels (critical load/level exceedance). The approach has been applied to strategies for emission reductions under, for example, the Gothenburg Protocol and the National Emissions Ceilings Directive. Although the critical load and level approach has been used on this national and European scale the approach is also being used in UK and other European countries for site specific risk assessment. Critical load/level maps for the UK have been developed to give a national picture of the relative sensitivity of soils, selected broad habitats and freshwaters, to acidification and/or eutrophication. The methods for calculating critical loads are based on internationally agreed approaches and UK maps are available nationally on a 1km2 grid for Biodiversity Action Plan (BAP) Broad Habitats that are sensitive to acidification and eutrophication. The methods for calculating critical loads and exceedances, including equations and maps (excluding ozone), can be found in the "UK Status Reports" (Hall et al, 2003a, 2004a). 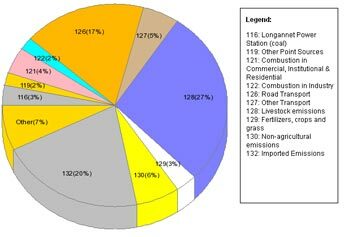 Critical loads exceedance is also a national Biodiversity Indicator. Conservation and regulatory agencies in the UK use critical loads and levels to assess the risk of impacts of 'plans and projects' (e.g. assessing impacts in relation to a permit application for an industrial installation or planning permission for a road scheme or agricultural unit) on protected sites and other semi-natural areas. A principle function of APIS is to provide access to critical loads/levels and pollutant information for such assessments. The following sections provide an introduction to the critical loads/level and pollutant information in APIS and direct the user to the specific tools for their enquiry. To begin to understand the response of habitats or individual species to air pollution the best place to start is the search by pollutant or the search by habitat look-up tool. For each pollutant-habitat combination in APIS there is a summary of key air pollution impacts and, where available, the relevant critical load/level for each pollutant. Alternatively you may want to read the Pollutants Overview or the Impacts by Ecosystem Overviews accessed from the homepage. For nitrogen deposition you may be presented with a number of different critical loads based on habitat type. In these situations you will need to choose the critical load that best fits your habitat of interest. For acid deposition you will not be given a critical load as this is based on the location of your habitat. The next section will describe how you can find critical loads/levels and background depositions and concentrations at any specified location in the UK. 5.1 Site Relevant Critical Loads and Source Attribution. For statutory conservation sites (Special Areas of Conservation, Special Protection Areas and Areas/Sites of Scientific Interest) APIS provides "Site Relevant Critical Loads" for acidity and nitrogen and acid and nitrogen deposition which is apportioned to sources. This tool should be used when you are assessing the impacts of nitrogen deposition and/or acid deposition on protected sites. The 'Search by Location' tool (section 5.2) still needs to be used for critical Levels and background concentrations of ammonia and other pollutants. A user can view the critical loads of, and deposition to, each interest feature for each site. Critical loads of acidity are assigned to each feature using six broad habitats for which acidity critical loads are defined. Critical loads for nutrient nitrogen are assigned based on the correspondence between EUNIS classes for which critical loads are set and the Annex I/II, SPA or SSSI interest feature based on published correspondence tables. Furthermore, deposition data for nitrogen and sulphur at each site is provided. 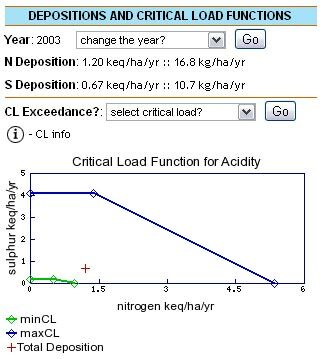 On the results page users can find the relevant critical loads for nitrogen and acidity for each interest feature for each site (Figure 1). Figure 1: Acidity Critical Load function graph for 'European dry heaths' Annex 1 feature. Deposition in plotted (red cross) on the function graph. The results page also provides information on the total nitrogen and sulphur deposited to a site including the source apportionment of that deposition. In other words each site has a breakdown of which sources contribute to the total deposition and by how much (Figure 2 below). Figure 2: source attribution for Nitrogen deposition at a SAC. Further information on the SRCL tool and how it was developed can be found here. For semi-natural habitat areas which are not statutory sites, use the search by location tool. The Search by Location tool lets the user enter a grid reference, chose a pollutant and specify the habitat, and retrieve the critical load or level and the deposition or concentration data at that particular location. Figure 3 below shows an example result for a pollutant-habitat combination of 'N Deposition - Raised bog and blanket bog'. The Search by location tool can be used to screen-out queries where there is clearly little risk of air pollution impact on a habitat or species at a specified location. Where this method suggests likely significant pollutant impact, a detailed site-based assessment should be conducted. 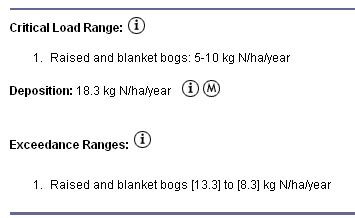 The results page displays the relevant Critical Loads Range for which there is a lower critical load range (5 kg N/ha/yr) and a higher upper critical load range (10 kg N/ha/yr). The Deposition section shows the background deposition of nitrogen at that grid reference. Remember to use the button to display more information on what the critical loads mean, how they are assigned, how the background deposition is calculated (for which years, units and resolution) and the button to view a pollutant map for the UK. Table 4 shows the pollutant types, years and resolution currently provided in APIS search by location tool. From Figure 3 above, the Exceedance is calculated as the deposition minus the critical load values (upper and lower). Any positive values in the exceedance indicate an exceedance of that critical load for nitrogen. In the example above the exceedance for 'Raised bog and blanket bog' would be 18.3 - 5 [13.3] and the upper end of the critical load range is exceeded in this case by 8.3 kg Nitrogen hectare-1 year-1. It is important to understand that different sources of information are used to set different critical load or critical level values. For SO2, the values are primarily derived from field observations, while for O3, the primary source is exposure response studies in field chambers, for NOx the primary source is experimental studies and for ammonia both experimental evidence and field observation has been used. The empirical critical loads of total N deposition for vegetation were derived primarily from field experiments and field observations. Uncertainties in the critical loads of acidity are also apparent as a consequence of a number of assumptions including the fact that no account is taken of soil variability within a 1km square, and acidity classes are assigned based on the dominant soil type present. There are also uncertainties in the Land Use cover map that is used to assign broad habitats (which affects national mapping of critical loads (see section 4.1) but not the APIS SRCL or search by location tools), and default values (e.g. base cation uptake) are often based on measurements at a limited number of sites across the UK. UK maps of pollutant air concentrations and deposition are generated by a combination of models and measurements (see NEGTAP Chapter 4). Concentration and deposition data are also available either a 1 or at a 5 km grid resolution. For many pollutants there is real sub-grid variability which is not revealed in the 1 km or 5 km averages. The uncertainties are particularly large for the concentrations of primary pollutants e.g. NH3, NOX and SO2. It is important to note that there is uncertainty attached to all these values, which has implications for the interpretation of the data including critical load/level values and exceedance, and depositions and concentration values. Further details on uncertainties are provided within the search tool. 1 Relevant installations are any plant where metals are likely to be limited by permit conditions or where metals are identified as a potential emission. At present these are likely to be (but not limited by) IED Chapter IV (waste incineration and co-incineration plant), ferrous and non-ferrous metals installations. It may also include chromium (and other) plating works. UNECE (2003): Empirical Critical Loads for Nitrogen - Expert Workshop, Berne 2002, Eds. Acherman and Bobbink. Environmental Documentation No. 164, SAEFL.